If sculpture is the art of the intelligence, as Picasso said, then it’s fitting that Natalie Clark is a sculptor. She’s the type of person who makes me want to write “worldly,” “savvy,” and “sophisticated” knowing full well that I’ve just played a solo game of literary overkill. That said, this lady is smart. Really smart. The sort of smart that effortlessly takes root in the span of an hour-long conversation over the phone and makes me want to hop on a plane, have a glass of wine with her and talk some more. But she’s not just smart, she’s charming, wickedly funny, unafraid to drop the f-bomb in the midst of an engaging articulation on the art of sculpture and the business of art. So maybe not just a glass, more like a bottle of wine. Far be it from me to add to anything Picasso had to say on art, but when it comes to Natalie Clark and sculpture, it’s not just the intellect she engages—it’s also the more subtle sides of herself and her audience. Whimsy and gravity are at play with our sense of place and connectedness. You might come across her most recent work, steel polyhedrons, tall and slick and graceful but strong, painted bright colors, in a Wyoming field framed by dramatic views of the Tetons and foregrounded by expansive farmland fields. Or you might find smaller steel versions carefully placed on a shelf in a gallery or studio. Either way, you will remember these sculptures. Clark’s work is many-layered and always evolving—just like the artist, a woman born and raised in England, educated in Brighton, and lured to the Tetons when an art professor of hers from the Chicago Art Institute commissioned her to create a sculpture for her home in Teton Village. Now she splits her time between there and Washington D.C., where she and her husband are surrounded by and often host dinners with much of the inside-the-beltway intelligentsia (yes, it does exist). Clark is a modern-day Dorothy Parker yet her roundtable isn’t at the Algonquin but rather, wherever she goes. And she goes many, many places. When I caught up with her, she was in D.C., on her way to New York, before heading back to Vegas and then to Europe. Just listening to her schedule gave me jet lag. But it’s this travel and the intense way that Clark engages with the world that animates her work. Inspired by her trips to the Namibian diamond mines, her bold polyhedron sculptures are, according to Clark, “About the journey of the gem and about the ways we assign value to things.” But it’s not just the process, although that—the way they dredge the beach for gravel, the staging area and the conveyor belts, the way men dig through the gravel looking for signs of something of value—interests her as well. 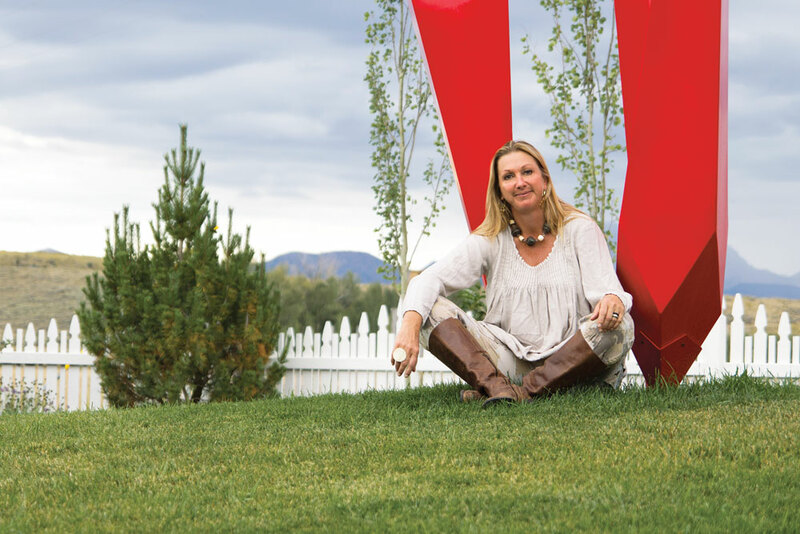 These sculptures are high-gloss, painted by a local in the Tetonia area who paints cars, so they shine in a way that echoes the shine of the gem. There is a playful energy to these pieces, as if they erupted from the earth where they stand. Clark doesn’t only work in explosive colors. Taking inspiration from the very utilitarian gabion walls that stave off erosion, Clark found beauty. Monochromatic and angular, her rock-filled gabion sculptures exude a grace balanced with utility and strength. Her peripatetic ways seem to bring her back to the fundamentals of a place—the raw materials, the forms, and the energy—and her work at once grounds you and sends you soaring. It’s quite a ride.